It’s been another great year for Opmantek Software with our products again proving to be a favourite with MSPs and large scale organisations. We have loved working with the community this year and delivering a variety of awesome new features and improvements that continue our tradition of delivering software that is easier to implement, more scalable, more flexible, able to operate in more diverse environments, saves time and provides faster ROI than our competitors. Here are a few of our awesome product team’s accomplishments in 2018. Real time delivery of the information you want to see. Open-AudIT continued to go from strength to strength in 2018, with new enterprise features making the automation of network auditing and compliance even simpler and the presentation of key information more streamlined. Custom dashboards were added in version 2.2 allowing users to present interactive real-time charts and graphs of the information that they care most about. For auditing teams, the dashboards may be focused on devices not seen. For security teams, it may be file changes that are the focus. Open-AudIT also reached for the cloud, with new AWS auditing features. We do the work for you with automated event remediations. 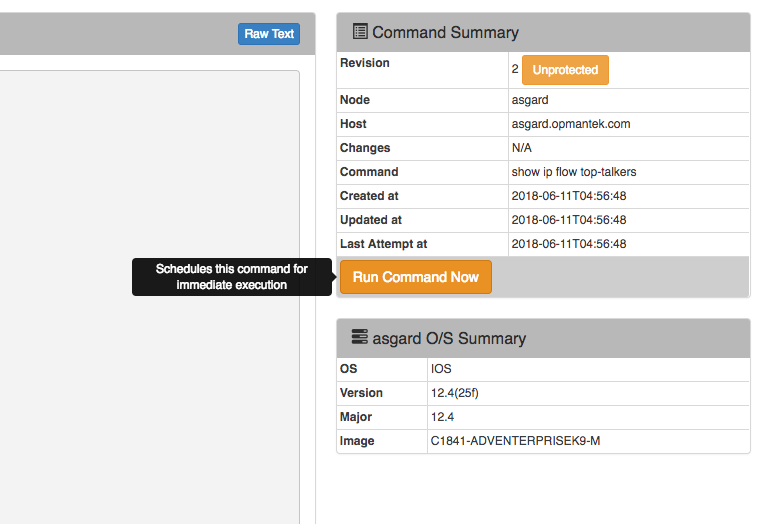 opEvents became even more powerful with a new in-app editor for Event Actions and policies that validates your commands as you go and shows the console output for event action validation. If you do make an error the editor will generate a new backup of your last revision so that you can start again! Pre-configured event actions also make sure that common remediations can be sequenced and activated in just minutes. Smart Interpretation of Configuration data. 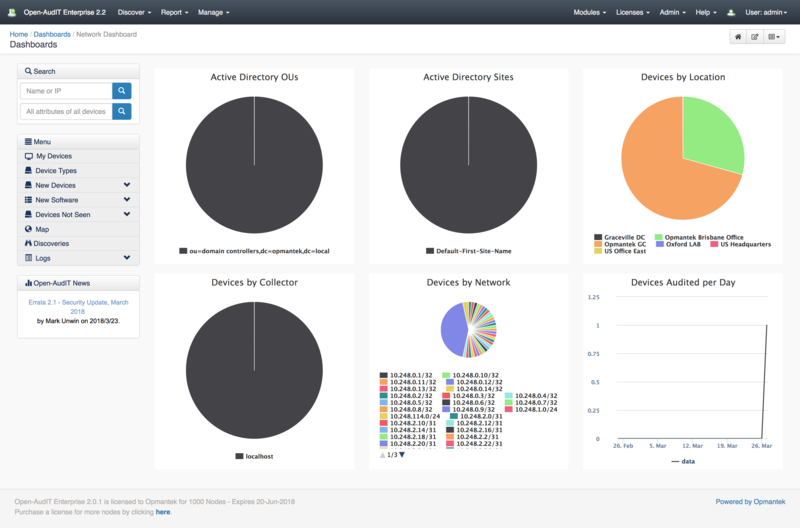 opConfig has always been a powerful tool with its ability to visually monitor and compare configuration differences between devices or against standards to ensure compliance policies are being maintained. This year we made it even smarter by allowing users to create custom plugins for the postprocessing of data. There are several pre-configured plugins that can be used to collect or transform configuration data and present them in an easy to digest information pane on your opConfig dashboard. Identification of bottlenecks before they affect performance. opFlow gained new charts this year that make identifying the root cause of poor network performance significantly easier. 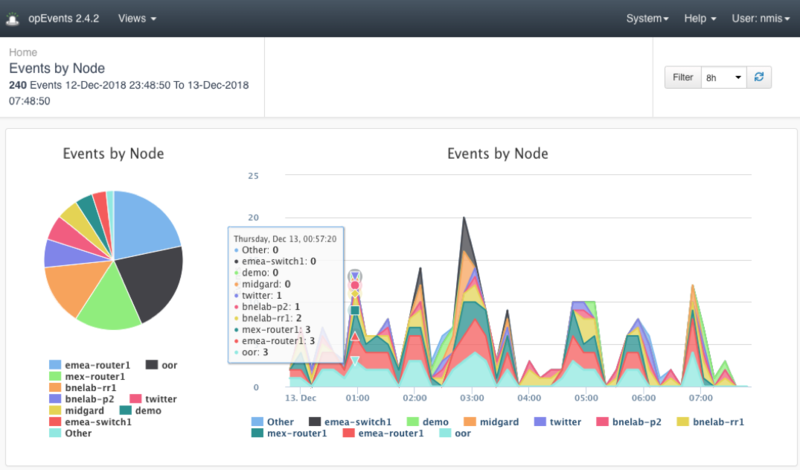 We improved the visibility of the opFlow Charts section so that you can quickly identify any bottlenecks by using a dual axis graphing the chart that shows you the information flow in bits per second, flows per second, or packets per second on the left axis and the network utilization percentage on the right axis. Intuitive set up and configuration wizards. This year we brought user experience into focus, looking at how we can make the Opmantek product suite easier to implement. The latest VM that was released at the end of last year has a new, more informative product activation dashboard and setup wizards that make sure that you are monitoring key devices within minutes of installing and activating NMIS and other modules.